Your firm can make any registered user an eFiling Firm Administrator (Admin). Only an Admin will see the Admin button after logging into his/her account. Click the Admin (A) button on the top navigation bar. Click the Firm Users button (B) on the sub-navigation bar. 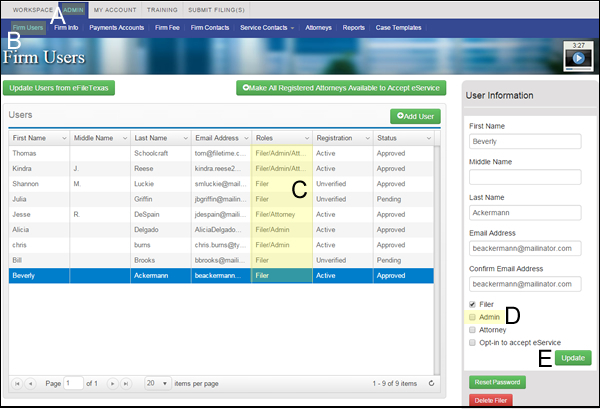 The Roles column (C) displays the role of all the registered firm users. Click the row of the user to be made an Admin - the row will be highlighted in blue. Click the Admin role (D). Click the Update button (E). That person is now a firm Admin and will be able to perform the same steps for other firm users in the future.